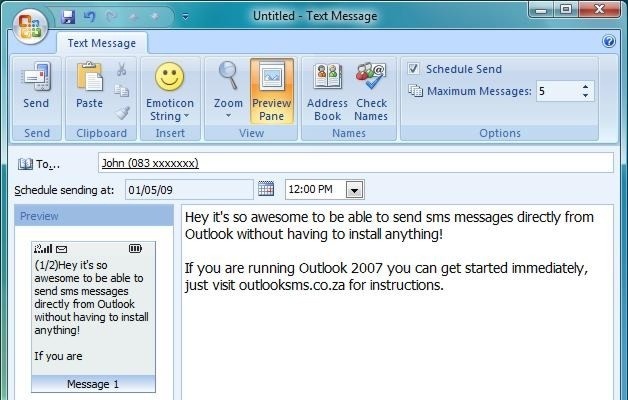 With the WinSMS Outlook Mobile Service and Microsoft’s Outlook 2007 and 2010 versions, it is now as easy to send and receive SMS messages as it is to send and receive email, and you don’t need to install any software! Please note that this method of sending SMS messages is not suited for sending bulk SMS. Max individual recipients is set by Outlook to 50, and max recipients in a distribution group should not exceed 500. If you wish to send large batches of SMS messages you must either use our SMS Software or if you are a developer you can make use of our Bulk SMS API. Support for Microsoft Office Outlook Mobile Services (OMS) has been removed from Microsoft Outlook 2013. Whilst WinSMS will continue to provide an Outlook Mobile Service (OMS) for previous versions on Microsoft Outlook, if you are using Microsoft Outlook 2013 you will no longer have the option to use the Outlook Mobile Services (OMS). Microsoft Outlook 2013 users can use the WinSMS Desktop Software for Windows, or WinSMS.mobi for online, web browser based SMS sending and receiving. If you were previously using Outlook Mobile Service (OMS) then you can use your existing WinSMS account with the Desktop Software and WinSMS.mobi services. Forward incoming messages as text messages to one or more cell numbers. Specify various conditions or rules to use. Send Reminders and Calendar Summary to your cell phone. Send next day’s schedule to your mobile at the end of every day. Send appointment or meeting requests to your mobile. 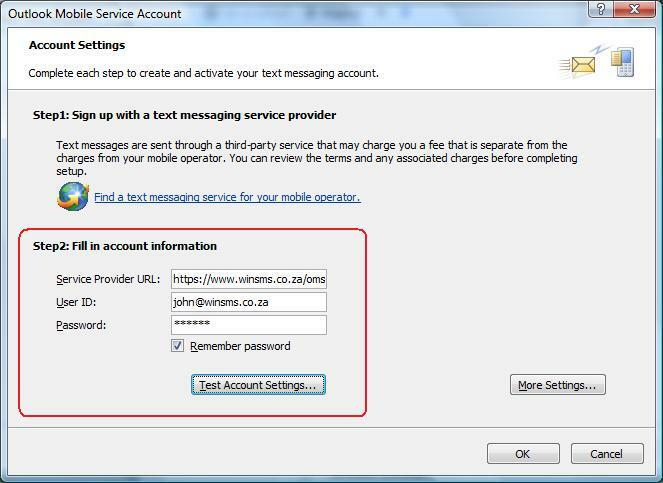 Step 1: Register an account with the only local Outlook SMS Service Provider – WinSMS. 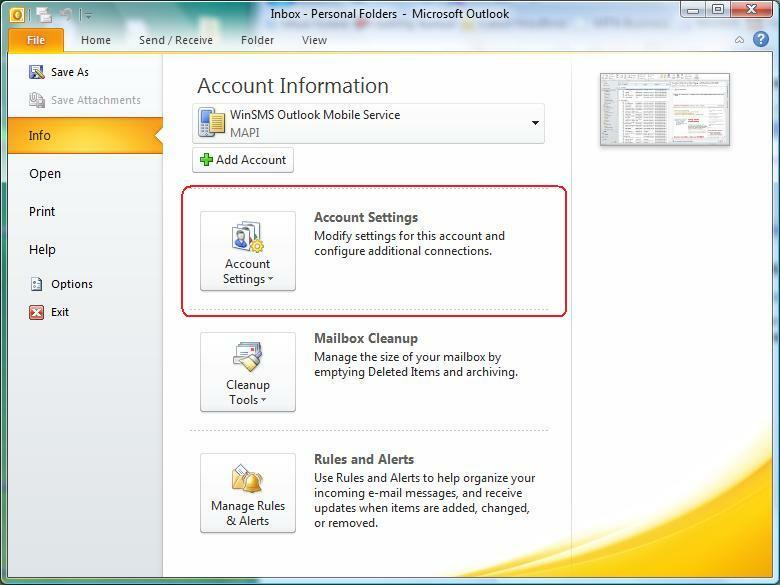 Step 2: Configure Outlook 2007 / 2010 to use that account. Step 3: Start sending SMS messages directly from Outlook. Once you have registered an account with an Outlook SMS Service Provider you need to configure Outlook 2007 to use that account. Open Outlook 2007, click on Tools and select Account Settings. 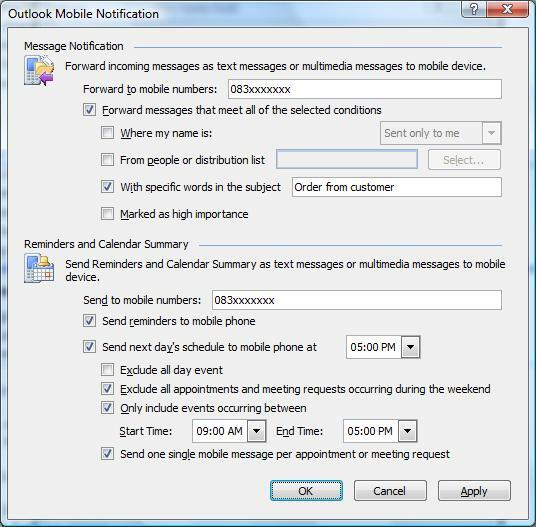 Select Other and then select Outlook Mobile Service and proceed by clicking Next. Under User ID and Password enter your WinSMS login name and your WinSMS password. 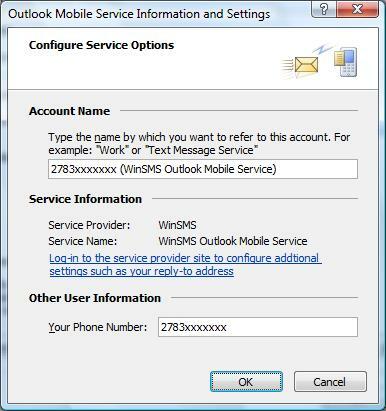 Click on More Settings to verify that Outlook 2007 was able to connect to the WinSMS Outlook Mobile Service. Check under Other User Information to verify that your cell number is correct. Click on OK to go back to the previous screen. 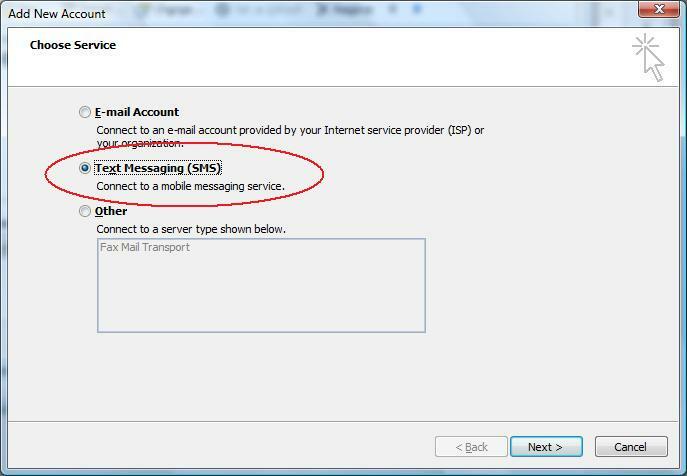 Click on Test Account Settings – this will instruct Outlook 2007 to send a test message to your cell phone. 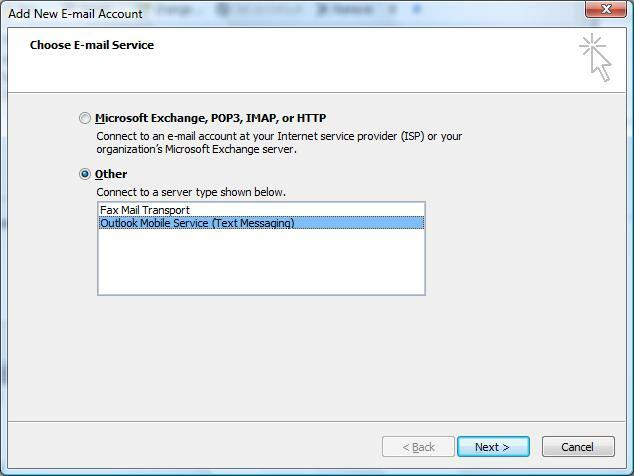 Once you have registered an account with an Outlook SMS Service Provider you need to configure Outlook 2010 to use that account. Open Outlook 2010, click on File > Info and then select Account Settings. Select Text Messaging (SMS) and then click on Next. 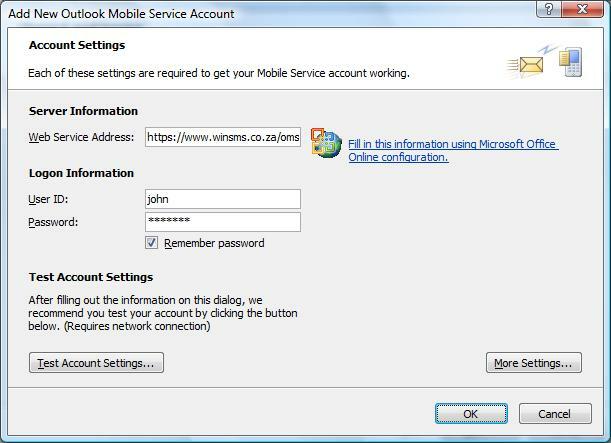 Click on More Settings to verify that Outlook 2010 was able to connect to the WinSMS Outlook Mobile Service. Click on Test Account Settings – this will instruct Outlook 2010 to send a test message to your cell phone. If you encounter any problems configuring Outlook 2010 to use the WinSMS Outlook Mobile Service, please don’t hesitate to contact WinSMS support or give us a call (during office hours) on 0861WINSMS.